Of all the books on this list, certainly the one that most qualifies as a "sleeper" in terms of notoriety is Robert L. Wilken's The Christians and the Romans Saw Them. Everyone I've mentioned the book to has never heard of it. It could be because Wilken isn't an apologist; he's a secular historian and the book is published by Yale University Press (which definitely cannot be considered a Christian publisher!) I hadn't heard about the book when I first bought it either. It was one of those extremely fortunate thrift store finds; I risked two dollars based on the title and was pleasantly surprised at the content. As Wilken explains in his introduction, the story of early Christianity has been told almost exclusively through Christian sources. Because of this, we can miss how the new belief system was being perceived by the more mainstream circles of Romans and pagans in that day. Wilken then goes on to draw on Pliny, Galen, Celsus, Porphyry, and Justin the Apostate—along with smaller mentions in other works—to paint a picture of Roman life, Roman belief, and just how this strange new sect was received. Many struggles of the early Christians shocking, such as the accusations that they were a cannibalistic cult. Others are very familiar to modern day evangelicals. In all, the book is an absolute eye-opener, not only from an historical standpoint, but in seeing how a small contingent in an empire that numbered sixty million souls grew to the dominant belief system in a few centuries. The Christians as the Romans Saw Them can even help your apologetic. Understanding the persuasive nature of early Christians in a culture where they were deeply misunderstood will give you better insight into your own interactions with others. The book is definitely a worthwhile read. You ca see the other book entries from this list here. In this series of blog posts, I'm presenting my list of "Top Ten Neglected Books for Apologists." These are titles that don’t appear too often on recommended apologetics resources, but they are books that I’ve personally found extremely helpful in my development as one who seeks to competently defend the faith. Check out our previous posts here. William Lane Craig has said that the study of philosophy is a key component to developing a strong apologetic.1 However, such a broad subject with so much history and interpretation can leave the student at a loss as to where to start. My next book recommendation was my first real introduction to philosophy, and it is excellent. 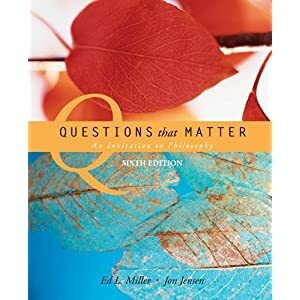 Ed L. Miller's Questions That Matter: An Invitation to Philosophy is actually constructed as a textbook for a college level philosophy 101 course. However, Miller's inviting style, along with the various definitions highlights and reading excerpts from pivotal works in the history of philosophy make this a great way for anyone to become familiar with the major players and key concepts that the discipline has produced. The thing I like most about the text is how even-handed Miller is on what can be very divisive issues. Miller, who holds a PhD. in philosophy from USC and a Doctorate of Theology from the University of Basel, Switzerland, is a member of the Society of Christian Philosophers. One would never know where his affiliations lie, however, as he is presents each concept and it various aspects with cool, clear neutrality. The great balance between an accurate, scholarly explanation of each philosophical concept and a friendly, easy-to-understand style is clearly a remarkable achievement. Because Questions That Matter is a textbook, it can be pricy. Amazon lists the title for nearly $100. However, it is widely used in intro to Philosophy courses, so picking up a used fourth or fifth edition will save you a lot of money. There is a Kindle version out now, too. 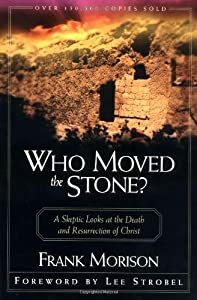 Top Ten Neglected Books for Apologists - #8 Who Moved the Stone? The resurrection of Jesus is the center point of any apologetic for the Christian faith. Paul makes this clear in 1 Corinthians 15 when he writes "if Christ has not been raised, your faith is worthless; you are still in your sins. Then those also who have fallen asleep in Christ have perished. If we have hoped in Christ in this life only, we are of all men most to be pitied." Christianity is not a faith founded on pragmatism, but it is a faith that's based on an historical event, Jesus rising from the dead. This conclusion has not escaped Christianity's critics. More than once, those antagonistic to the faith have realized that by knocking out the resurrection, they would with one swift blow topple all of Christian theology. Frank Morison was one such skeptic. In his first chapter, Morison explains that he thought the historical nature of Jesus "rested on very insecure foundations." He then decides to try and debunk the faith by examining the last seven days of Jesus’ life. In this way he could finally highlight the flaws in the fable. But, as Morison attests, his book does not become the undoing of Christianity. Indeed, it becomes the tale of "a man who originally set out to write one kind of book but and found himself compelled by sheer force of circumstance to write another." Following the evidence, Morison reasons through each of the popular scenarios offered to escape the miracle and ultimately comes to the conclusion that the resurrection must be true. At the end of his journey , Morison has been left with no choice but to embrace the resurrection as a real event. While the book has parallels with Simon Greenleaf's landmark The Testimony of the Evangelists, Morison is a reporter and not a judicial scholar, so his writing is a bit more approachable. Also, since this book was written in the twentieth century, the language and thought are more accessible to the common reader today. Scholarly books on the resurrection have grown tremendously in the last twenty years, with scholars like N.T. Wright, Michael Licona, William Lane Craig, and Gary Habermas continuing to produce an incredible amount of evidence for the reality of the resurrection. But Who Moved the Stone? is a nice, compact way to open the topic up to friends or family that would not otherwise read such weighty tomes. Lee Strobel credits this book as an important stepping stone in his journey to faith. Give Morison a read, and I think you’ll find it more enjoyable and thought provoking than you may realize. Top Ten Neglected Books for Apologists - #9... A Romance Story? I'm continuing building my list of top books that I have found valuable in building my defense of the faith, but are not as well-known as some others. Some are more technical or academic in nature; others are not thought of as a teaching tool for apologists. My next entry falls into the latter category. 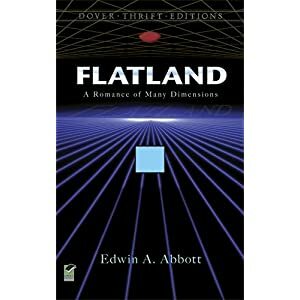 Number nine in my list as a little book entitled Flatland: A Romance of Many Dimensions by Edwin Abbott Abbot. Now, given the title, you might think that a romance book is a crazy thing to place in a list of apologetics texts, but this little work, written in 1884, is actually a scathing commentary on the restricted class structure Abbott saw in England at the time. What makes the book more valuable, though, is how Abbott deftly explains why the constraint of a dimensional boundary limits the way one can understand life. Indeed, the resistance Mr. Square (our story's narrator) puts up in trying to grasp a third dimension and how being able to traverse in three dimensions would make observers in the lower dimensions react as if they were seeing a miracle. For example, a three dimensional being could seemingly miraculously "pop" into a two dimensional plane by simply rising above the plane, moving forward and then descending back into the two dimensional space again. It also brings up interesting speculations (and since they are only speculations, I won't elaborate further) of what our resurrection bodies could be capable of. Flatland: A Romance of Many Dimensions is truly a mind-stretching book Best of all, since it was written nearly 130 years ago, it is in the public domain and free for download. You can grab either the Kindle version or many other versions, including PDF to read on your device or print out. If you'd like a physical book, you can get the annotated edition from Amazon here. Apologists are all about resources. Sourcing material, gathering good arguments and examples, and trading knowledge are ways people grow in defending their faith. So recommended books, videos, podcasts, and such are replete in apologetics circles. I'm getting asked fairly regularly about book recommendations and resources, but rather than simply put together a top ten list of titles that also appear on other lists, I've decided to look at some of the lesser known books that have played a role in my growth as an apologist. Therefore, I've decided to start a list of Top Ten Neglected Books for Apologists. These are books that don't make most lists, but are very worthwhile. 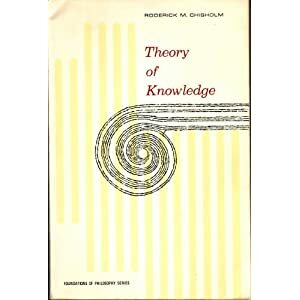 Kicking off the list is #10 - Theory of Knowledge by Roderick M. Chisholm. Chisholm is a masterful philosopher and this is a very well written book on epistemology - basically, how we know that we know things. It is deceptively short at 99 pages, but it requires careful study and the student should plan on devoting many hours to read it slowly and master its contents. If you've ever wanted to know what ideas like what really constitutes beyond reasonable doubt or why you don't have to be certain of something to have knowledge, then this book is for you. I believe the book is out of print, but Amazon does have links to used versions available online. Follow this link to find them.